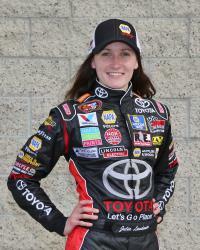 Julia Landauer was runner-up in the NASCAR K&N Pro Series West race at Meridian Speedway in Idaho. When Julia Landauer was the runner-up in the NASCAR K&N Pro Series West race at Meridian Speedway in Idaho in September, she made history. She matched the highest-finish for a woman driver in K&N Pro Series West history. She was joined by another woman driver on the podium. Nicole Behar was third, marking the first time in NASCAR K&N Pro Series West history two women drivers finished on the podium. 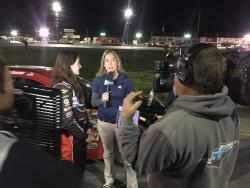 Landauer, a driver for Bill McAnally Racing and the only women in the NASCAR Next program, posted her best result of her rookie season at Meridian Speedway. She benefited from some late crashes in the race, but was able to maneuver around the mayhem and work her way to second place. The significance of having Behar finish behind her did not escape Landauer. She and Behar are in a select group of women drivers in the NASCAR K&N Pro Series West. Landauer is the only woman driver in the NASCAR Next program. Behar is a NASCAR Next alum, one of the few women to be selected for that program. Landauer is in an even more select group than NASCAR women drivers. She has a degree from Stanford in science technology and put her NASCAR career on hold until she finished college. The 24-year-old is back in a race car and resuming her climb up the NASCAR ladder. She switched from go-karts to stock cars and oval racing when she was 16. After she graduated from Stanford, she won the Limited Late Models championship at Motor Mile Speedway in Virginia, the first woman to accomplish that feat, and started racing in the K&N Pro Series West. Julia Landauer is one of the NASCAR Next drivers and currently fifth in the standings. With one race remaining in the K&N Pro Series West schedule, Landauer is fifth in the series standings and second in the rookie of the year standings. She has six top-five finishes in 13 races. In addition to her runner-up finish at Meridian Speedway, she was fourth in one of the K&N Pro Series West road course races at the Utah Motorsports Campus in September. “I really didn’t know what to expect going into K&N,” Landauer said. “It’s such a big jump up from what I raced last year. The number of races, the races are three times the distance. It’s a heavier car, it’s a faster car. The competition was definitely more stout than last year. I didn’t quite know what to expect. I wanted to finish in the top 10 as much as I can, get a few podiums and I really wanted to get a win. I definitely thought I was capable of getting top five. The K&N Pro Series West season ends at All-American Speedway in Roseville on Oct. 15. Meridian Speedway is similar to All-American Speedway in that they are both short track ovals with not a lot of space to pass. Landauer said she expects her team to be just as strong in Roseville as it was at Meridian. “My crew chief and I, we’ve been communicating a lot all year, trying to figure out what we really need to be the best, what he needs to be the best, what I need,” Landauer said. “We just went in strong, had a good practice. All season, we have been struggling a little bit with qualifying. At Meridian, I qualified eighth. One of the things Landauer says she has been working on this season is her aggressiveness on the race track. At the beginning of the year, she said she played it safe. But as the season wore on, she learned how to work her way through the field and put herself in position to win races. Landauer has taken advantage of being a NASCAR Next driver. She has met with some people in NASCAR who have been helpful in furthering her career. She said she is grateful for making those connections. 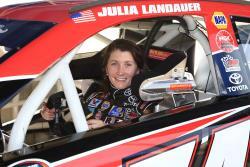 Julia Landauer is second in the NASCAR K&N Pro Series Rookie of the Year standings. Having K&N as a sponsor in the Pro Series West has also been helpful. Landauer said being able to race at tracks on the same weekends as Sprint Cup and Xfinity Series races puts her team and other K&N Pro Series West teams and drivers in contact with NASCAR supporters.